Stainless steel, two tier, pack off conveyor. Equipped with (2) 14" wide x 132" long stainless steel shelves, (1) 24" wide x 132" long Intralox belt with an infeed and discharge height of 41" and (1) 24" wide x 132" long Intralox belt with an infeed and discharge height of 24". Bottom belt has 9½" overhead clearance. Both belts independently powered by 1 hp drives each with variable speed controls and push button stop / start. Stainless steel, dual level, pack off conveyor with flexlink style belts. 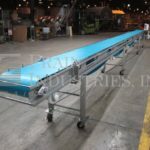 Bottom level conveyor equipped with a 13½" wide x 132" long belt, (2) 15" wide x 110" long pack tables, 22" infeed/discharge height and 10" overhead clearance. 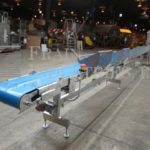 Top level conveyor equipped with a 8" wide x 132" long belt, (2) 8" wide x 110" long pack tables and an infeed/discharge height of 41". Both levels are independently powered by 1 Hp drives. Stainless steel, pack off conveyor. 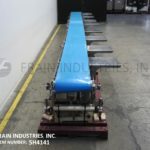 Conveyor equipped with a 16" wide x 110" long Intralox belt, 31" to 37" infeed/discharge range and 23½" wide x 96" long pack table 6" above belt height. Stainless steel, two tier, pack off conveyor. Equipped with (2) 9" wide x 212" long stainless steel shelves, (1) 10" wide x 250" long Intralox belt with an infeed and discharge height of 50" and (1) 24" wide x 270" long Intralox belt with an infeed and discharge height of 33". Bottom belt has 7½" overhead clearance. Both belts independently powered by ½ hp drives each with variable speed controls and push button stop / start. Mounted on a (6) leg frame with casters. 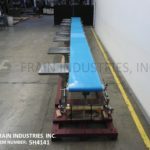 16" wide x 377" long stainless steel belt conveyor. 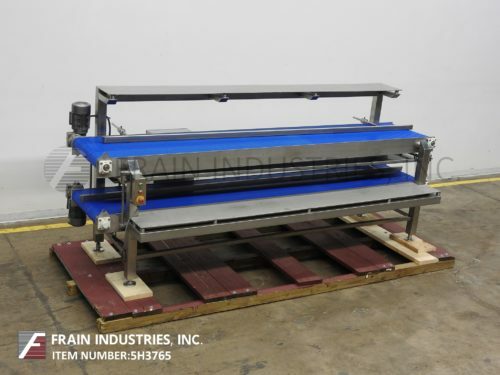 16" wide and 377" long food grade belt has an infeed and discharge of 35". Equipped with a ½ Hp drive, variable speed control, moveable side mounted bin racks and mounted on casters. 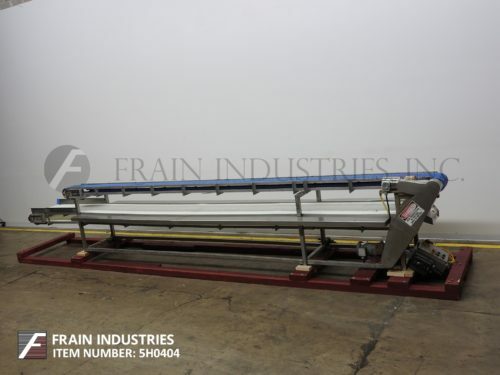 Grote, 15¾" wide x 391" long stainless steel belt conveyor. 15¾" wide and 391" long food grade belt has an infeed and discharge range of 32" – 36". Equipped with a ¾ Hp drive, variable speed control, moveable side mounted bin racks and E-stop. Unit mounted on leveling legs. S/S packoff conveyor with 30′ belt. Unit has a 14"(W) belt feeding in @ 40"(H) and an 8"(W) belt feeding in @ 60"(H). Equipped with (2) 1 HP Reliance motors. S/S packoff conveyor with 30′(L) food grade belt. Unit has a 14"(W) belt feeding in @ 40"(H) and an 8"(W) belt feeding in @ 60"(H). Equipped with (2) 1 HP Reliance motors. Unit mounted on a painted steel frame with locking casters for mobility.